Manage SSL certificates, creating self-signed certificates and certificate requests, and importing certificates signed by a certificate authority. The Secure Remote Access Appliance comes with a self-signed certificate pre-installed. However, to effectively use your Secure Remote Access Appliance, you also need to create a self-signed certificate at minimum, preferably requesting and uploading a certificate signed by a certificate authority. In addition to the CA certificate request feature, BeyondTrust includes functionality for obtaining and automatically renewing its own TLS certificates from the open Certificate Authority Let's Encrypt. To create a self-signed certificate or a certificate request from another issuer, locate the Security :: Other Certificates section and click Create. In Certificate Friendly Name, enter a name used to identify this certificate. From the Key dropdown, choose to create a new key or select an existing key. Enter the remaining information pertaining to your organization. If the certificate being requested is a replacement, you should select the existing key of the certificate being replaced. 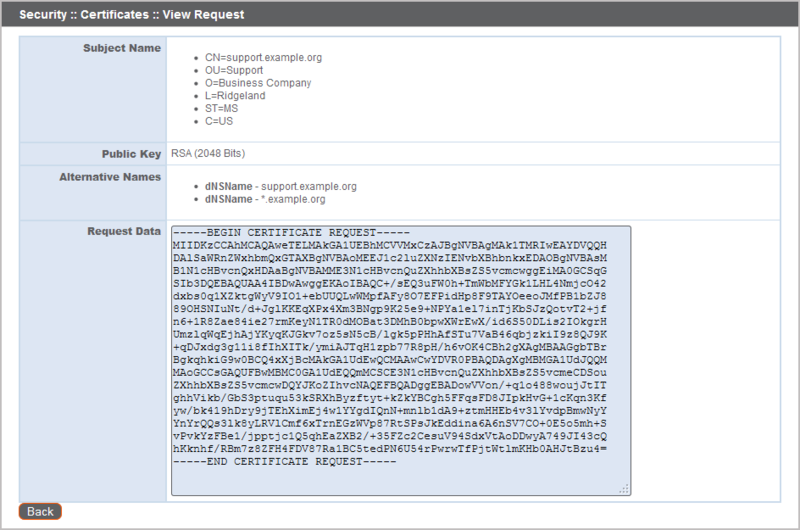 If the certificate being requested is a re-key, you should select New Key for the certificate. For a re-key, all information on the Security :: Certificates :: New Certificate section should be the same as the certificate for which re-key is being requested. A new certificate friendly name should be used so that it is be easy to identify the certificate in the Security :: Certificates section. Required information for the re-key can be obtained by clicking on the earlier certificate from the list displayed in the Security :: Certificates section. For a new key or re-key certificate, the steps to import are the same. If you intend to obtain a signed certificate from a certificate authority, click Create Certificate Request to create a certificate signing request (CSR). Otherwise, click Create Self-Signed Certificate. To upload certificates and/or private keys, click Import. Browse to the first file and upload it. Repeat this for each certificate sent by your CA. Often, a CA will not sent their root certificate, which must be installed on your Secure Remote Access Appliance. If the root is missing, a warning appears beneath your new certificate: "The certificate chain appears to be missing one or more certificate authorities and does not appear to terminate in a self-signed certificate". If the intermediate and/or root certificates are different from those currently in-use (or if a self-signed certificate was in-use), please request an update from BeyondTrust Technical Support. BeyondTrust Technical Support will need a copy of the new certificate and its intermediate and root certificates. If you are exporting only one certificate, you immediately can choose to include the certificate, the private key (optionally secured by a passphrase), and/or the certificate chain, depending upon each item’s availability. Click Export to start the download. 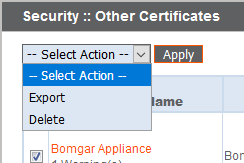 When selecting to export multiple certificates as one file, click Continue to start the download. With this option, only the actual certificate files will be exported, without any private keys or certificate chains. 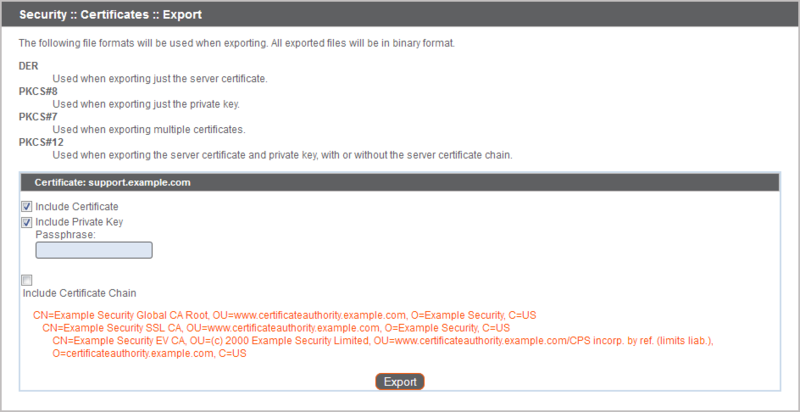 To include private keys and/or certificate chains in the export, select individual export and click Continue to view all selected certificates. For each listing, choose to include the certificate, the private key (optionally secured by a passphrase), and/or the certificate chain, depending upon each item’s availability. Click Export to start the download. The private key should never,or rarely, be exported from an appliance. If it is stolen, an attacker could easily compromise the BeyondTrust site which generated the key. If it does need to be exported, be sure to assign a strong password to the private key.